The Elite Cuisine 7” Electric Skillet is small and compact making it the perfect appliance to bring on camping trips, RV road trips, or for preparing small servings and solitary meals. Skillet has a 32 ounce capacity with non-stick cooking surface for easy cleaning. There is a removable locking handle and tempered glass lid with cool-touch knob. Adjustable temperature control for cooking versatility. After cooking, remove the handle from the skillet and clean-up is quick and easy. 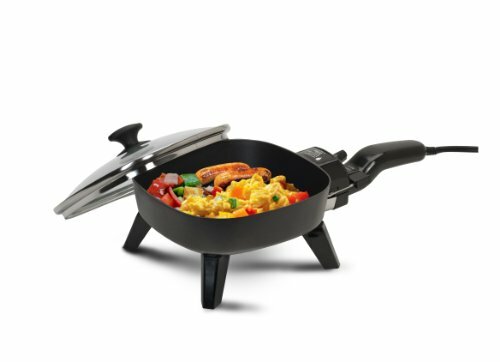 This mini skillet has all the features of larger skillets but its convenient small size is perfect for scrambling eggs, frying bacon, or making mini pancakes.